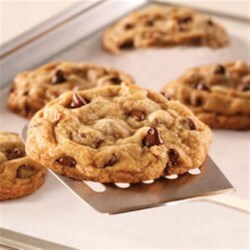 "Classic chocolate chip cookies bake up browned and tender on sheets of parchment paper." Preheat oven to 350 degrees F. Line cookie sheets* with Reynolds Parchment Paper; set aside. On another sheet of Reynolds(R) Parchment Paper, combine flour, baking soda, salt and cinnamon; set aside. Beat together butter, brown sugar and granulated sugar in a large mixing bowl, with an electric mixer, until light and fluffy. Beat in eggs and vanilla. Add flour mixture gradually to butter mixture; beat until well blended. Stir in chocolate chips and nuts. Drop by rounded tablespoons onto parchment-lined cookie sheets. Bake 10 to 12 minutes or until lightly browned. Cool. Discover the simple trick that takes the mess out of baking delicious cookies. Use your cookie sheet to measure out the perfect amount of Reynolds® Parchment Paper, with nothing hanging over the edges, for cookies that bake evenly and don't stick. See a Real Mom's simple trick for baking 5-star cookies. Clean-up has never been easier. Here's a video showing this handy kitchen tip. It's a great cookie and I will try the cinnamon to see what that brings to the party! pretty good, but I've had better. Needs a little more flavor for me. Maybe more chocolate or something.